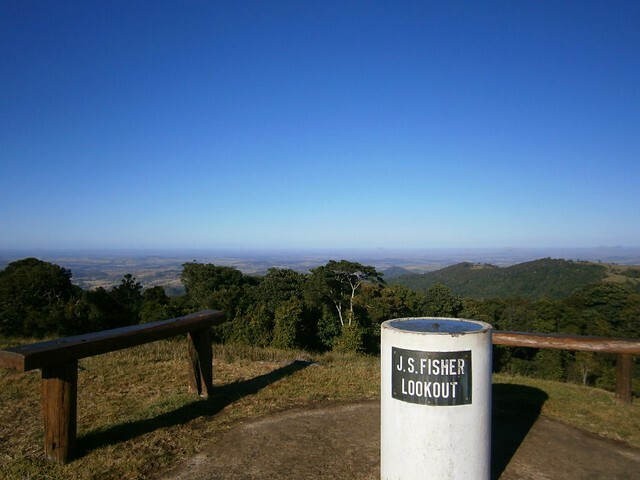 The magnificent peaks of the Bunya Mountains are a three hour drive to the northwest of Brisbane. 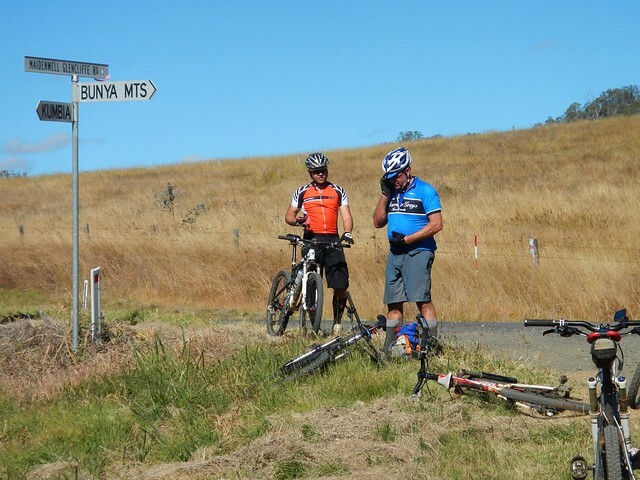 Our plan today was to ride from Burtons Well – close to Mount Kiangarow, the highest point in the Bunya Mountains at 1,135 metres above sea level. 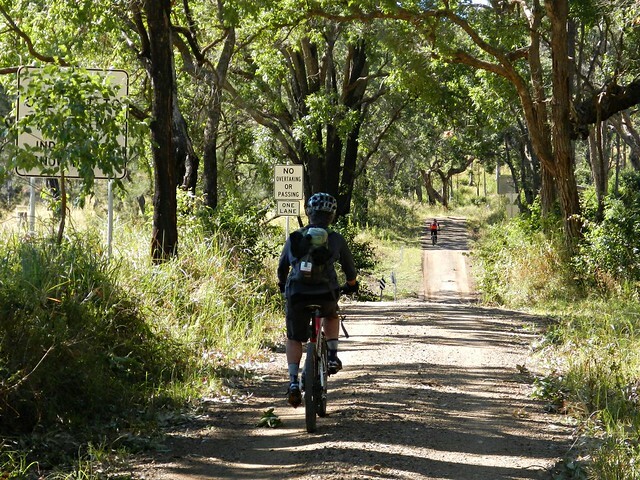 We’d then follow forestry roads eastwards towards Maidenwell where we would have lunch, before climbing back up the range to finsih at Yarraman. 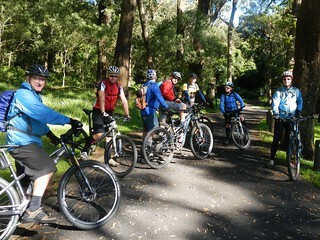 This was a point-to-point ride, which meant we’d finish at a different point to which we started. This always raises logistical challenges – bringing two vehicles, retrieving one vehilce from the starting point at the end of the ride, etc. My friend, Paul, kindly offered to be our driver for the day, dropping us off in the mountains, then driving back to Yarraman to pick us up. 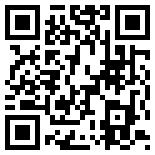 This saved us a lot of hassle at the end of the day. 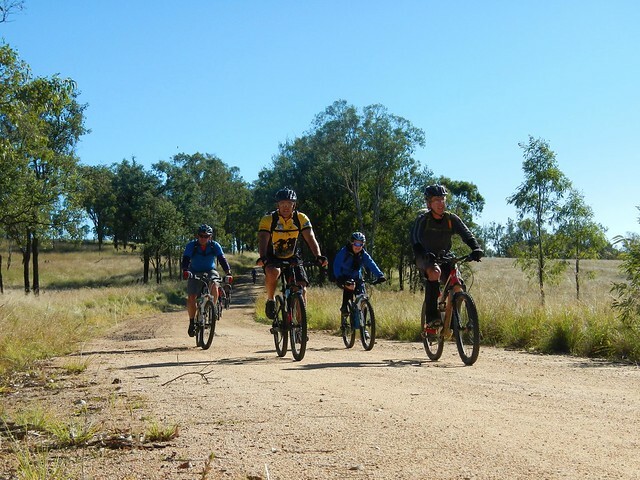 We met with some of the guys from Toowoomba Mountain Bike Club in Yarraman before making the final drive up to the top of the mountains. 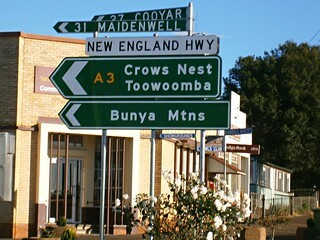 The Jarowair Aboriginal people call this place “Boobarran Ngummin” which, literally translated, means “mothers’ breast”. They believed that the creators of the land, people and animals lived here. 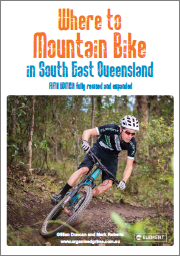 These mountains were so important to the aborigines of southeast Queensland, that every three years they’d walk several hundred kilometres from places as far away as present-day Northen NSW, Brisbane, Moreton Bay Islands, Sunshine Coast, and Wide Bay. The journey would take upto several months, and during that time they’d engage in trade, marriage ceremonies, spiritual discussions and gathering the nuts from the abundant Bunya Pines. Even today, the Bunya Mountains is the site of the largest natural Bunya Pine forest in the world. 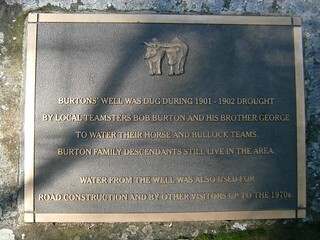 Burtons Well is named after local pioneers, Bob aand Geroge Burton, who dug the well in the drought of 1901 to provide water for their horses and bullock team. On this morning in late May, at such a high altitude, and under clear skies, it was very cold. So we all rugged up in anticipation for what would be a fast, cold descent down the mountain. 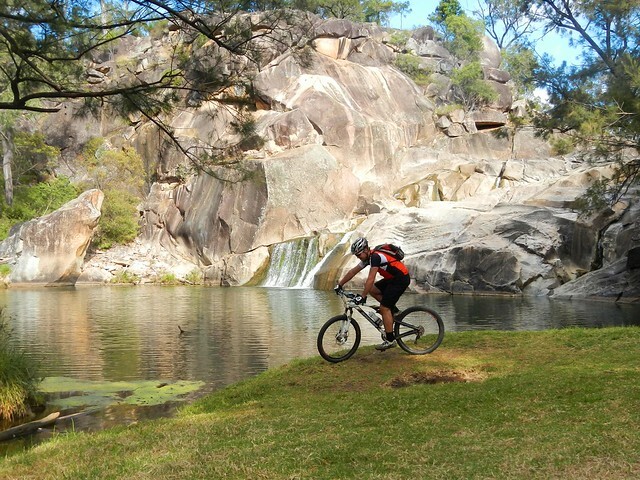 This was the fastest descent I have ever done on a bike. The winding paved road drops about 500 metres in altitude in the space of about 5 km. At one section where the road dropped steep and straight, my GPS tells me my top speed was 99.9 km/h. 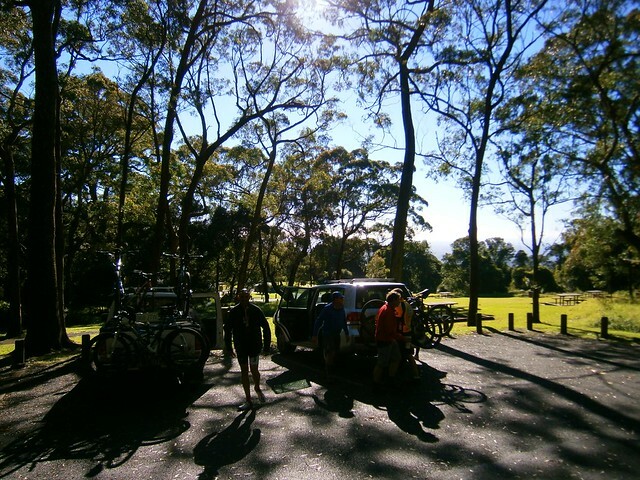 Bunya Mts Yarraman 2013-05-25 from Darb Ryan on Vimeo. 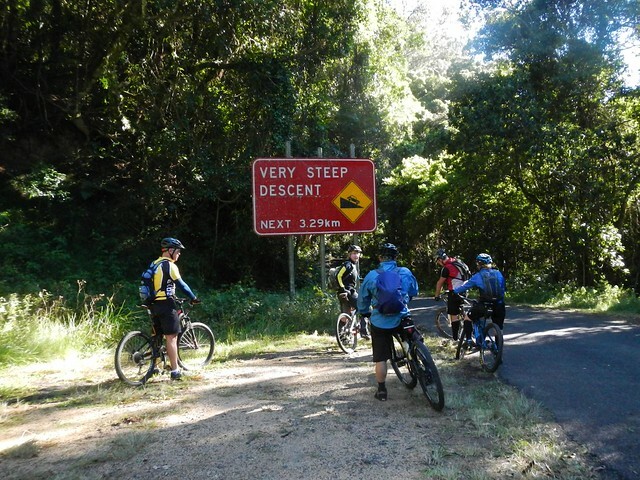 Here’s a video of that descent (and the rest of the ride) by my good friend, Darb Ryan. The road whizzed by in a blur of howling wind, chilling cold, and my shrill cries of “On your right” as I passed a few other riders. I still haven’t confessed to Liz how fast I went. 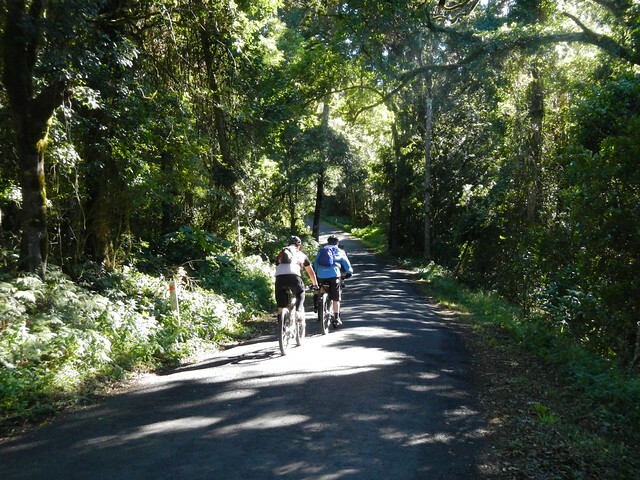 In little more than ten minutes we were out of the rainforest, down the mountain, and rolling through open farmland with frozen faces, and cold noses. A few of us took the opportunity to remove some of the cold-weather gear and prepare for the hard work ahead. 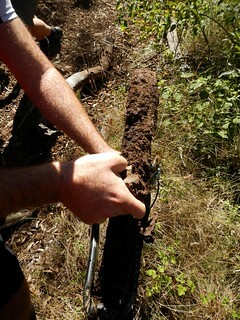 The dirt roads through Alice Creek are made of black soil. It’s nice and smooth in dry weather, but after rain it turns to sticky black goo. After a few minutes riding on it, our wheels caked up with thick mud. It was impossible to ride. 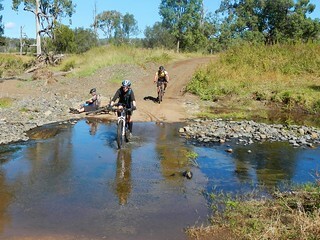 We stopped and scraped the mud from the tyres and our shoes, then pushed the bikes. But in a cruel twist, the mud still stuck to the tyres while we pushed. So we had to carry the bikes for a couple of km. 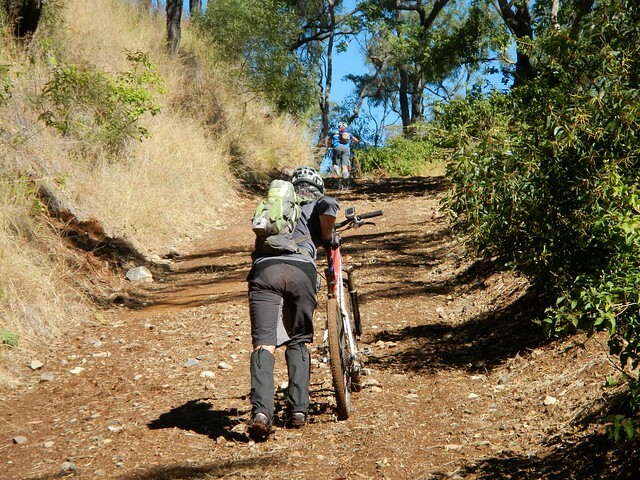 Not only was the ground akin to wet cement, some of those hills were impossibly steep. 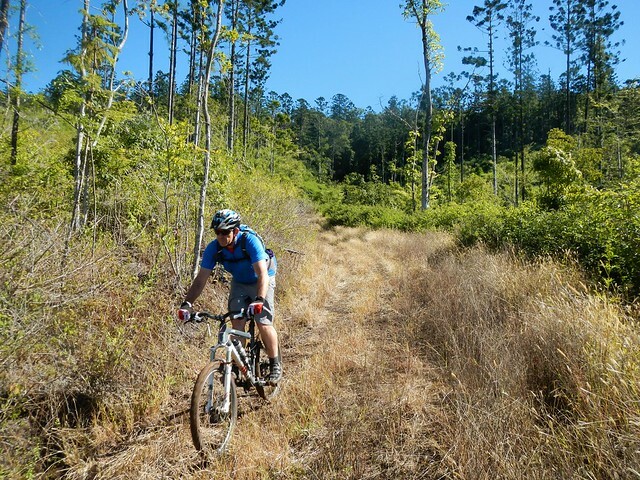 Thankfully, even the steepest of hills come to an end, and soon we were enjoying some more bumpy descents through a hoop pine plantation. We followed the trail along Barker Creek for a few kilometres, crossing it several times. The road surface gradually improved as we got closer to Maidenwell. Eventually we came out on the paved road we’d driven along a few hours before. The fields of sticky black mud that we had encountered earlier had delayed us by about an hour. 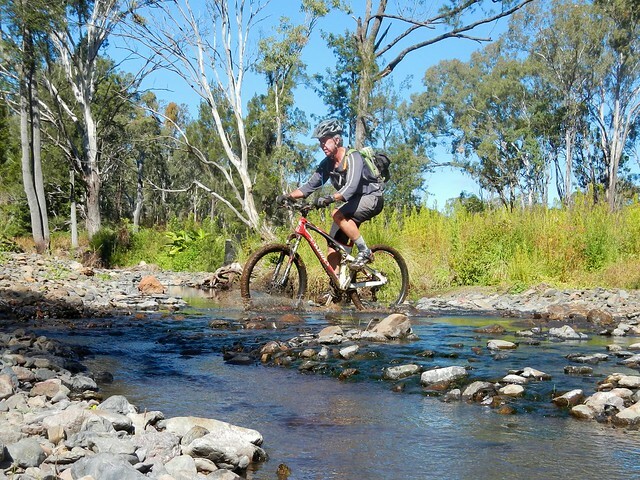 Although it’s difficult for a mountain biker to admit, it was actually a relief to ride on the bitumen for a short while before lunch. Ten hungry cyclists decended on the Maidenwell General Store and ordered mountains of food. A few of us took the opportunity to dry out wet, muddy footwear on the footpath outside. It took a while, but after about an hour, we had all eaten and were ready for the final leg of the ride. 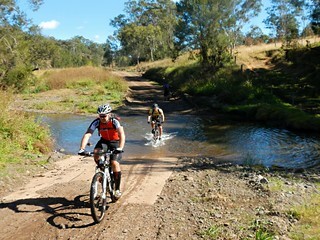 We stopped by Coomba Waterhole on the way back. This picturesque location is a great spot for a picnic, and (in warmer months) a swim. 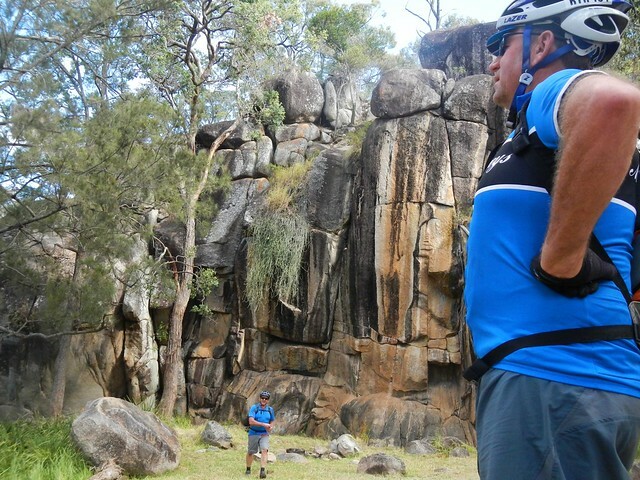 The imposing rock formations are fascinating. But in today’s chilly weather we decided to forget about having a swim. 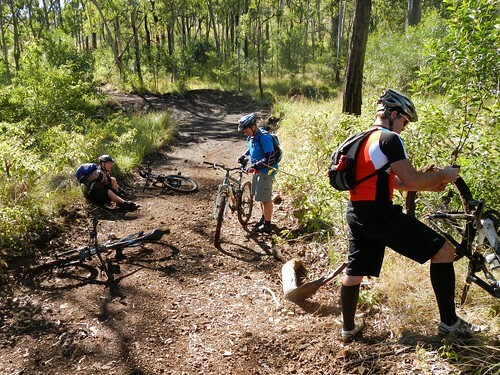 After a long climb up yet another nasty hill in Yarraman State Forest, we took a rest at the top and looked back towards the west. 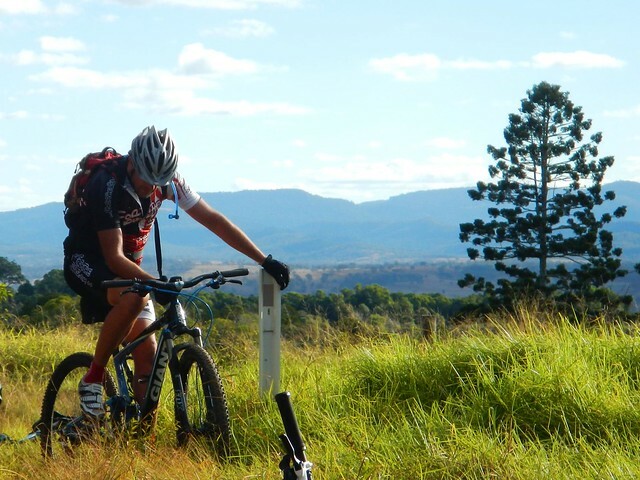 A long way distant, on the horizon, we could see the shadowy peaks of the Bunya Mountains. It was a great feeling to think “We’ve just ridden from there”. 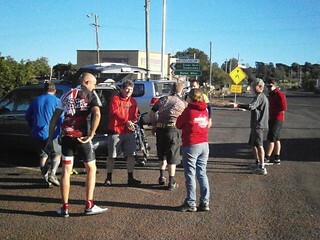 We rode about 70 km in about 7 hours including breaks. During that time we descended almost 1,800 metres, but we also had to climb about 1,200 metres, during which I burned about 3,000 kcal. This was a tough ride, made more difficult by the sticky mud, and the logistics of starting and finishing such a long way from home. 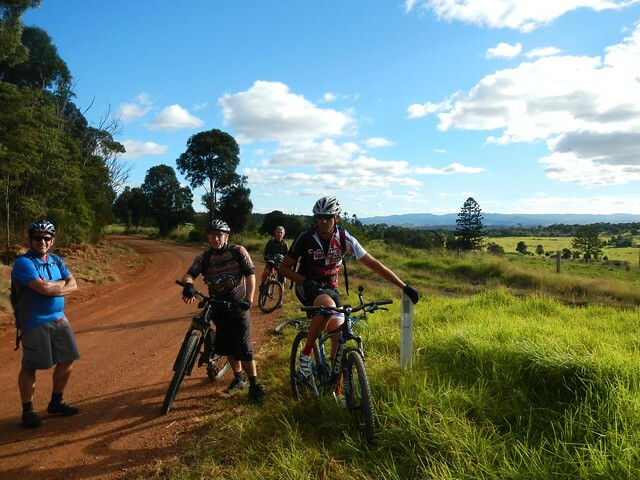 The Bunya Mountains are stunning – well worth the effort of the visit, whether it’s on a mountain bike or in a car. This one rates 9 out of 10 on the tough-o-meter. Thanks everyone for great company on a spectacular ride!